We are at the Ohio Cattlemen’s Association Young Cattlemen’s Conference for the last 2 days. Learning a lot and updating our skills. The cattle industry is constantly evolving and this event is a great way to get connected. We had a great weekend at the Kentucky Beef Expo. 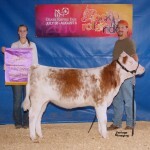 Flight Path’s Xtraordinaire is the 2011 National Beefalo Show Grand Champion Female. Flight Path’s Xenia is the Reserve Champion Female. Thank you Stokerybos Farms. Ohio’s newest Beefalo owners and breeders. Visiting Michaela Farm in Oldenburg, IN. Yesterday we bred 6 full-blood Beefalo cows to a variety of Shorthorn bulls. Trying to get some exciting show calf prospects. Will post results as they come. Flight Path’s Xtraordinaire wins Grand Champion Female at the National Beefalo Show in Springfield, MO. Xtraordinaire is an excellent example of the hybrid vigor you can expect when crossing a bovine bull (in this case Shorthorn) with a full blood Beefalo Cow (Flight Path’s Rebecca). 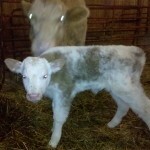 Our most recent calf, born 4-19. Today we had our first set of twins. 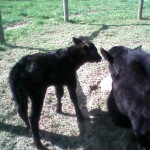 Two nice heifer calves – one red, one black. Calves number 3 and 4 for the year. We are just back from the Kentucky Beef Expo and the National Beefalo Show where Flight Path’s Userious was awarded Reserve Champion Bull. He is shaping up to be an excellent genetic influence on our heifers and looking to have his first calf crop on the ground in 2011. 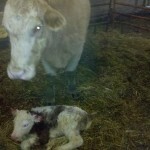 Our first calf was born about 6AM Tuesday, January 19. This is an early start to our calving season which will jump into high gear in April/May. For now, take a look at this little heifer calf. 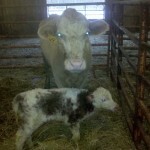 She is our first successful A/I calf and a great little Beefalo – Shorthorn Cross. Looking for her to add diversity, frame, and showiness to our herd in the future.